Hannah Genders offers advice on creating a biodiverse area. One question I get asked regularly is how to create a successful wildflower meadow – or often someone has had a go at creating a wildflower area and it has failed. There are some simple rules to follow, and a wildflower meadow or wildflower border is a wonderful thing to have in a garden, both for us and for increasing biodiversity and helping our bee and butterfly population. I will try and lay out some basic rules to help you if you are thinking of making one in your own garden, and September is an ideal month to do this. Firstly, look at the aspect. Most wildflowers like full sun, or a very small amount of dappled shade, but not all day. if you only have a shaded area you could create a woodland flora area with bluebells, primroses and cowslips, but for the classic wildflower meadow it will need lots of light. Secondly, check the soil – the type of soil is very important so you need to know whether you have a clay or sandy soil. A simple test is to roll a small handful of soil in your fingers; does it feel gritty and not form any sort of ball? Then you have a sandy soil, free-draining and light. If you can form a ball of the soil when it is damp and it looks a dark colour, you probably have a loam soil (between sand and clay). If you can roll the ball into a sausage and it is sticky to the touch you have a clay soil, which is much slower to drain. Once you have checked the texture of the soil you also need to do a soil test to check the PH (acid or alkaline). This will denote the type of wildflowers and grasses you should be looking at growing. The other very important factor in creating a meadow is to check the nutrient levels in the soil, particularly how much nitrogen is stored there. All meadows like a very low nutrient content, especially where nitrates are concerned. Too much nitrogen will encourage all the tough, broad leaf grasses which you want in a normal lawn but not in a meadow. Once you have done all these checks and worked out your soil type, its PH level and nutrient content, you are ready to make a start. The first trick is to remove any top soil that is too nutrient-rich and use it elsewhere in the garden. If you are digging out any areas, save the sub soil (the light-coloured, poor soil underneath) and put this on the area where you want to create the meadow. On larger projects, where we are building a lake or large pond, we literally take the poor soil from the bottom of the new pond area and spread it over the surface for the meadow. The whole area will then need rotivating to make a fine seed bed. If you have a lot of very pernicious, perennial weeds in the area, such as couch grass or dock, you may need a good month of spraying these off before you start seeding. 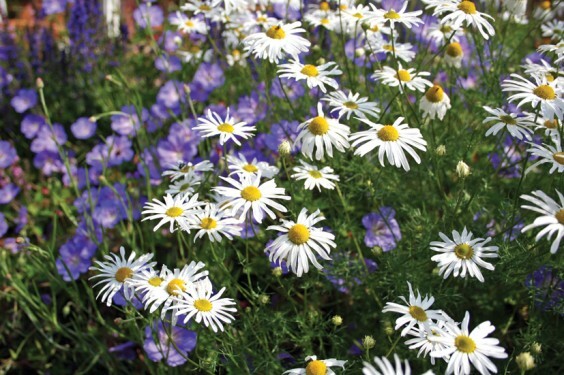 Knowing your soil, it is now worth buying the correct wildflower mixture for your situation. Mixtures will contain about 80 percent native grasses; fine-leafed grasses like Fescues, Bents and Oat grasses. The other 20 percent will be made up from wildflowers like yarrow, scabious and cranesbill. Any meadow takes time to establish and some species will come in profusion the first year and then get knocked out as the matrix of plants builds up. Poppies are a good example; I usually do an over-sow with poppies in the meadow’s first year (so order some extra poppy seed and literally sow them over the rest of the meadow) for a wonderful show. Cornflowers can also be used like this to give some initial colour, and they will usually last a few years longer than the poppies, which thrive in newly-turned soil. For added colour you can put some garden perennials in the mix – in my meadow at home I’ve added some red yarrow and a deep purple leafed clover. As long as they are the same species they shouldn’t take over, but will happily grow alongside the native plants. The amount of seed needed for a meadow sowing is very small – five grams per square metre – and the trick is to make an even sowing. On a large area hire a seed spreader; on a smaller area is it worth marking out blocks in square metres as you go so that you don’t throw too much seed into one area. Once the meadow is sown, hopefully it will get enough rain, but do watch that it doesn’t dry out. For a helping hand, plug plants of extra wildflowers can be added to the seed mixture, which will just help the flowers establish in the first few years. I always add extra seed of a plant called yellow rattle, a very important flower that creeps along the ground and suppresses the broad-leaved grasses that you don’t want. A meadow will take about five years to establish from seed and require extra maintenance during this time, such as spot spraying any weed you don’t want and re-sowing any patches. Mowing only needs to be undertaken once a year on established meadows, and a bit more often on new meadows to get the roots growing, but as a general rule, mow at the end of August or early September for summer flowering meadows or late summer for spring flowering meadows. If you want to create a wildflower meadow on a small area, the wildflower turf products are very successful – they are an expensive option at around £10 per square metre, but an ideal solution for the small garden. Whatever size of meadow you create, it is worth it, giving you something beautiful to look at and providing valuable nectar for our wildlife.